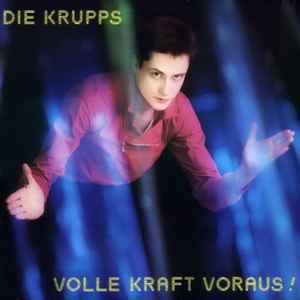 Die Krupps ‎– Volle Kraft Voraus! VKV is a very interesting release. At times it sounds like Gary Numan in its simple and raw synth melodies, with the theatric vocals of an 80s new wave / post-punk band. A strange but compelling combination that works really well here, and is a lot more engaging than Die Krupps' first experimental LP. (It was a very similar progression to their fellow countrymen DAF and their first two albums). However you want to classify the album, at its core is a fun, upbeat vibe that nicely bridges the gap between punk and what would later come to be known as EBM. By the way, the 2008 Remastered version of the album is superb - far superior production quality (it's really a night and day difference), every element is very forward and clear in the mix now, and you'll probably never want to listen to the original again. It's very true to the original tracks, with one exception - Goldfinger for some reason has been extended to nearly twice its original length, whereas everything else is more or less the same duration.